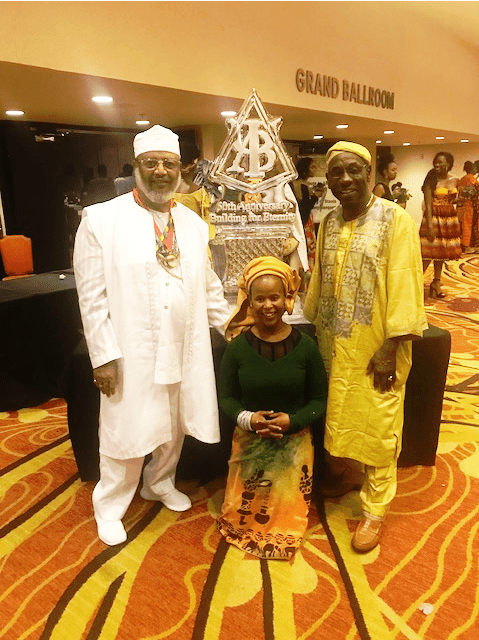 The 50th Anniversary Conference of the Association of Black Psychologists (ABPsi) opened with a reverent and celebratory tribute to the ancestors and welcome to those present. Presented by Daktari Dance Medicine Collective, 50 dancers, drummers and cultural workers sprinkled medicine into the hearts and minds of those in the grand hall that night. From the welcome call, Fanga Alafia, to the “Invocation and Libation,” Diaspora dances Yanvalou, Parigol and Ogum and Spoken Medicine, the theme for the 50th Annual Conference “Building for Eternity,” June 27-July 1, 2018, was evoked, ratified and confirmed. Conference organizers with co-chairs Lawford Goodard, Ph.D., and Patricia Canson Griffith, Ph.D., thoughtfully planned what is certain to be one of the more historic gatherings of Diaspora Black scholars anywhere to date. From workshops to poster presentations, awards luncheons honoring constituents and community members such as Colin Kaepernick, Ryan Coogler, Jason Shankle Sr. and Annelle B. Primm, M.D., MPH, to the uniquely African Mbongi Assembly Talks, Gathering of Stools Ceremony, Sunrise Ceremony: The Raising up of the Ancestors and the Multi-faith and Family Breakfast, the 50th Anniversary Conference was an opportunity to look back, as Baba Wade Nobles, co-founder of ABPsi, said, not with nostalgia but with a critical eye to see what of the past is worth retaining and what should be discarded. Key going forward and highlighted in many sessions, like the Preconference Training on Trauma Informed Care for Black Families, African Centered Therapy in Practice: Integrating Practices of Spirit into Therapy, Depression, Stress and the Myth of the Black Super Woman, Racism and Clinical Supervision, Mentoring the Next Generation of Black Psychologists, a Critique of the Ivory Tower, The Ubuntu Community-Based Approach for Healing from Racial Wounding, Navigating Blackness and Queerness in Black Spaces, was the need, as Dr. Cheryl Grills and Baba Wade shared in their work, to stay grounded in community practice, to not feel as if the clinician is the expert, because in most cases, the village holds the wisdom and with shared tools much more is accomplished. In presentations by South African clinicians and scholars, we saw how traditional medicine and ethics is changing the treatment of the dominant culture who are majority consumers. It is a conscious decolonizing process which is fascinating in its reach and power. Often Baba Wade spoke of the colonial language used to name African ways of being, and its inadequacy. There is much left to do; however, at 50, ABPsi has certainly laid a mighty foundation and is to be congratulated – its founders present that evening and via skype saluted: Wade W. Nobles, Ron Brown, Harrold Dent and Ed Nichols, Bob Williams and Dan Williams. Fifty years later, the movement towards Black mental health and ABPsi’s development of treatment protocols for Black wellness spills into the dominant paradigm with theory and evidence based proof necessary for vetted intervention and advocacy. Black wellness is a priority with Black psychologists, who in more recent years serve as advocates for disenfranchised and overlooked persons like Black children in public schools, immigrants, disaster survivors – Katrina, Haiti, West Oakland fires last year, prisoners, chronically underemployed, homeless and traumatized communities. ABPsi from its inception grounded itself in principles of African liberation and African spirituality. It also saw and sees itself as a convener, evident at the 50th Anniversary Conference in the Second Mbongi: Healing Our People, Social Justice, Activism and the Future of Black Psychology. Moderated by Dr. Theopia Jackson, the panelists were Danny Glover, Fania Davis, Ph.D., Lena Miller and Tawede Cheryl Grills, Ph.D.
A Kikongo concept, the Mbongi is a tangible resolution represented by a nail hammered into a wooden nkinsi or spirit doll. There were no actual wooden dolls at ABPsi 50, perhaps because the sessions were interrupted or incomplete; however, in Congo, the conversation continues until a solution or solutions emerge. Topics ranged at ABPsi 50 from the history of Black psychology as a discipline with Dr. Linda James Myers, Dr. Ifetayo Ojelade, Dr. Derek Wilson, Dr. Nyala Joan (Smith) Cooper and Dr. Kobi K.K. Kambon. The panelists spoke to a new film directed by Shawn O. Utseu, “Toward a Black Psychology: Origin and Evolution of a Discipline” (2018). The film looks at the legendary APA conference 50 years prior when Black psychologists walked out. At the height of the Black Power Movement and the grief over the killing of Malcolm X, followed that year by the murder of Dr. King, these noble men and women, some seated in the ballroom that morning, decided to rise up and challenge a system grounded in racism “failed to provide models and programs conducive to solving African American problems” (“ABPsi 50” p. 121). Seven hundred Black psychologists came from all over the world to attend the conference. The classic essay or treatise, “Voodoo or IQ: An Introduction to Black Psychology (1975)”, authored by scholars Syed Khatib, D. Phillip McGee, Wade Nobles and Na’im Akbar, define and clarify what it means to be African in America and why Black psychology is a radical position on “the roots [or radicals] of human thought” (8). This look at freethinking radicals points to a later examination of memes by Dr. Nobles (smile). In this one pivotal essay, the scholars look at melanin and the first people. It also connects the absence of melanin to diseases like Parkinsons (12-13). In the section on Black intelligence, the writers consider the empirical nature of Western scientific research in opposition to African psychology which is rooted in “the ontological assertion that that there is more to the world than meets our material eyes … [w]hether one prefers to call this non-material reality ‘energy,’ ‘spirit’ or ‘manna’” (14). The self is more than meets the literal eye. We are more than our physical presentation – a lot more. We are also not isolated in our development of an identity. Individualism is not an African concept. “African psychology conceptualizes self as an unqualified collective phenomenon while respecting the uniqueness of the individual self as a component of the collectivity” (68). The often cited concept that our identity is tied to that of the community that gave birth to our consciousness (Ubuntu), is more than a tag-line. It is so crucial to Black or African survival that its dismissal is our collective demise. This is the reason why at ABPsi 50 the organizers looked at opening discourse to include, especially in the Mbongi Sessions, topics central to Black community umoja or unity. Whose voices are omitted or marginalized, seemed to be the query for ABPsi 50. Other areas of Black psychology defined in this article or essay look at the concept of time, concluding with human goals. Voodoo or IQ as gauntlet shatters the philosophical and intellectual ceiling sheltering the notion of white supremacy situated in Western ivory towers. Mbongi 4: The Emerging Shift in the Legalization of Marijuana: The Untold Mental Health Challenges to Black Families and the New Legal Profiting, facilitated by the Hon. Desley Brooks, JD, Oakland City Council featured Linda Jackson, Carlton Williams and Monifa Willis, PMHNP-BC. Ms. Alicia looked at how Black people are being kept out of the industry as business persons, not consumers. In the model developed by Councilperson Desley Brooks, Oakland entrepreneurs have an opportunity to control and facilitate the cannabis industry. Putting Black people in control and making outside interests partner with Black people as lead in the development of the cannabis industry – distribution and development (harvesting) – shifts the perception. Carlton Williams spoke often in the Q&A about how the white investors tried to disappear him, yet they couldn’t because he holds the key. If they want to do business in Oakland, they have to come through a person like himself. The benefits to the economy are tremendous for the formerly disenfranchised. Also, the way the community engages in this industry, that is, safeguards were also discussed. Mbongi 5: To Be Healthy, LGBTQ/SGL, and Black/African: Theorizing, Defining, Healing Ourselves While Building for Eternity with Dr. Kenneth Monteiro, Amorie Robinson, Ph.D., Dr. Marjorie J. Hill, Eddie D. Banks and Bishop Dr. Yvette Flunder, moderated by Dr. Taasogle Daryl Rowe. Besides this stellar Mbongi, there were many sessions during the conference by presenters which looked at the relationship between Black psychologists, Black community and the silenced or marginalized voices of the Black or African LGBTQ/SGL communities. This last Mbongi followed the sunrise tribute to the ancestors at Oscar Grant Plaza where honored ancestors depicted on scrolls encircled the living in a tribute. Select Spirit Walkers carried the scrolls to the plaza where they were unrolled and placed in a circle, the living standing inside. As Baba Wade called their names and shared something of the revered ABPsi ancestors’ lives, the community greeted the ancestors, libations were poured and prayers shared. It was truly fitting to the founders and those who held space for liberating discourse at a time when the development and cultivation of Black thought was constantly undermined by those who would have us remain slaves. Later that evening, the 50th Annual Conference concluded with a Tribute to ABPsi Founders and a Gathering of Stools Ceremony and Banquet. William “Baba Bill” Jones III was a culturally aware community leader in Brooklyn, a role model for youth who developed Black independent education, volunteer coordinator for the annual International African Arts Festival (IAAFestival), a priest of Rastafari and a priest of Sango in the Yoruba tradition. A 1967 graduate of Howard University, he brought dashikis and the history of Nat Turner to his fellow students. Baba Bill’s passionate concern for the advancement and excellence of African people embraced the Diaspora. What kind of policy do we choose? Can we pack you a bag or do you have everything you need already? Do we say good bye or good luck? and gifts known and unknown? count the blessings then, now and forever more? Your work is done: Ashay. Congratulations! We thank them for your life, an impeccable example … we ask Oṣun to sweeten the waters between realms, Obatala to wrap you in white cloth and for Oya to help in your transformation. Travel well, Brother William “Bill” Jones III. Visit often. We will love and miss you but know you are with us forever. You taught us how to honor you by how you honored others – those living, those departed and the yet to be born. Who knows . . . you might come back (smile). It is good that we have such conferences, where people read more about interesting things and discuss today's world problem! I think this is a great informative article. It is good that we have such conferences, where people read more about interesting things and discuss today’s world problem!